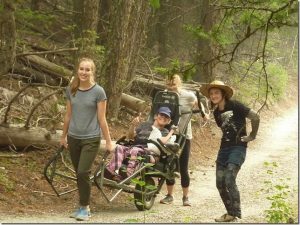 Earlier this year a group of friends in the South Fraser Active Living Group read an email that grabbed our interest – “Come camping with BC Mobility Opportunities Society (BCMOS) at Agur Lake,” the invitation said. “Why not?” we thought. Everything from the accommodations to the outdoor surroundings exceeded our expectations. It was really wonderful to spend the weekend with such a great group of campers and staff in a magnificent outdoor setting. During the journey, some of us were worried about the lack of full-service gas stations along the way, as we drove up to Agur Lake Camp. Luckily, we only needed to stop once each way to fill up gas. Driving in a caravan was something we’d recommend, as we could help each other during the adventure. Kim’s husband Uli helped us fill our gas tanks, which alleviated our anxiety. We were also able to stop for groceries and share small meals together during the drive, which was fun. At the camp, the new transfers to the toilet and beds were also something we worried about beforehand, but when we arrived, our worries were soon put to bed–literally. The hospital type beds and roomy accessible bathrooms significantly reduced stressors even more. We cannot say enough nice things about the weekend. Everything was well organized and all the staff and volunteers were so kind and helpful. It’s hard to pick one highlight! The cabin accommodations were first class and definitely exceeded our expectations. During our time at the camp, we had multiple choices for how to spend our days. 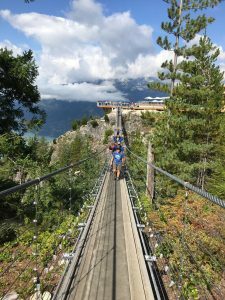 In spite of the smoky sky, BCMOS arranged for us to try various outdoor activities. It was so much fun attempting to fish with some unique Sun-Rype fruit snack baits! 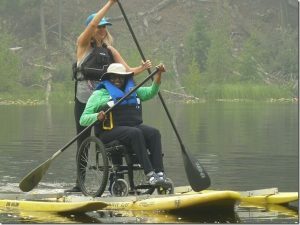 Several of us enjoyed paddle boarding with Access Revolution. It was a nice experience to get out on the lake, and if felt like we were entering the Field of Dreams as we paddled through the tall reeds to the hidden end of the lake. The camp’s many paved pathways made it possible to travel around the site easily and allowed us to see various views of the lake. The incredibly thoughtful caretakers helped and offered us useful suggestions about the camp. They even helped us to collect bags of large, beautiful pinecones. We noticed it was easier to independently travel around in a power wheelchair, but we all managed with a little help from our friends. For our meals, it wasn’t your typical camping food! We got to prepare delicious meals in kitchens that were well organized and easily accessible. On Saturday night, we got to attend a BBQ hosted by the BCMOS for their 30th anniversary – we mingled, ate, and had a blast playing outdoor games. It was such a treat to hear Danny and Uli play their gitars and sing until late that evening. It was such an amazing weekend as we all got the opportunity to participate in fun activities and games available to us. Many people were happy to get the chance to chat with other campers and enjoy a relaxing time away from the hustle and bustle of our daily lives. Sure, it was an adjustment to not have Wi-Fi, but it was also nice to have a break from it all. We want to give a big thank you to all the staff and volunteers from BCMOS and the Agur Lake Camp Society for arranging such an amazing weekend in the wilderness with old friends and new! A special thank you to Alix from BCMOS who was extremely helpful, she went out of her way to help others and definitely made our weekend super enjoyable. It was really quite spectacular. Do we want to go back again next year? YES! Sign us up. See you next year! Thanks for the blog, it’s loaded with a lot of helpful info. This helped me a lot.